Eyes are often referred to as the ‘window to the soul’. Our waxing professionals at Essential Beauty will create your individualised perfect brow shape during your appointment. Be sure to bring along an exact idea of what you are looking for. These Dos and Don’ts below, will ensure that your waxing experience is top-class. People whose eyesight is fading and have trouble applying their eye makeup. An eyelash tint is great if you wear no mascara. This will also improve the look of mascara application. A brow tint will add colour to your most important facial feature. It will take you from ordinary to fabulous in a heartbeat. An eyebrow wax will give you well shaped, sculptured and defined eyebrows. A lash lift is a semi-permanent curl that can last up to 4 weeks. Party lashes are a group of lashes that are bonded in and amongst your natural eyelashes. This will give you fuller, longer and thicker lashes for an evening look or special event. Party lashes can last up to two weeks. Use Essential Beauty eye enhancements to create your perfect look. The best brow shape for your face is completely individualised. Every design is unique. Having said that, there are five basic eyebrow shapes that are defined and our waxing professionals will help you find the best natural brow shape that works for your face. It is critical to have our eyebrow professionals help you determine which shape is best for your face so that you can have the best possible result. Here are some common face shapes noting that everyone is individual. A round face can usually be complemented with sharp angled brows which have a high arch. This helps create defined better lines. A heart-shaped face is complemented with a natural and soft angled arch which will draw attention to the upper half of your face. Most square faces have very well-defined sharp angles as features. A slightly angled brow will create balance and uniqueness to the face. At Essential Beauty, we believe everyone deserves to have beautiful eyebrows that get noticed. Using our unique four-step waxing process, we will prepare and pamper your eyebrows for the most comfortable experience you have ever had. And the result? Perfectly shaped, well defined eyebrows that will leave you feeling gorgeous. In fact, we’re so confident that we would like to give you $10 off your first wax. In order to be truly beautiful, we have developed our unique four-step system for flawless and gorgeous brows. Consultation and evaluation to determine the best eyebrow shape that will compliment your face shape, bone structure and the shape of your eyes. Our pre-wax skin cleanser will remove dirt and oil to ensure maximum grip on the hair whilst being gentle on the skin. This helps to give a clean, sharp and smoother finish to your brow shape. We have a choice of two waxes specially formulated just for Essential Beauty salons. Our waxing professionals can help you chose the best option for your individual skin type. Our waxes are gentle on the skin and have a superior grip on the hair for maximum comfort and results. Rejuvenation – We finish off with a relaxing massage around your eyebrows. We use our unique ingrown hair serum, Ingro Stopper to soothe and protect your skin. Doing it yourself: grooming your brows at home can lead to removing too much hair leaving unnatural shapes and possible over tweezing. It is best to leave your brows to the professionals who have tertiary qualifications in determining what the best eyebrow shape is for your face. Threading: involves using cotton thread to remove rows of hair from your eyebrow. It is a new technique with drawbacks. Waxing is a quicker and less painful solution. This is because threading removes each hair on an individual basis creating an uncomfortable experience. Further, with waxing, you can achieve sharp clean brow lines that last longer. In addition, threading is also problematic on sensitive skin especially if you have skin conditions like acne. Our Natural Comfort Film Wax and trained waxing professionals can work on even the most sensitive skin. It is difficult to find a skilled threader, but our trained waxing professionals are available all day every day. Tweezing: Similar to threading, tweezing is a slow and more painful experience than waxing. In addition, the results do not last as long and there have been many cases where people have “over tweezed”, causing permanent damage. Having said that, tweezing is still a great way to take care of any stray hairs that are left over and can be used in between your appointment to keep your brows looking they’re very best. Eyebrow waxing is not just for the ladies. Manscaping including eyebrow waxing is becoming very popular with men who are welcome at Essential Beauty to book in with our eyebrow professionals. If you have unruly brows, we recommend visiting one of our waxing professionals when your eyebrow hair starts to extend beyond the brow line or when there is a unibrow or monobrow. Our eyebrow professionals have been trained in proper eyebrow shapes for both men and women. You can relax knowing that you will receive the optimum result you deserve. If you have thick or lots of hair, then waxing is a great option for you. Depending on your hair type, once you visit us, you can have an eyebrow shape that will look flawless and awesome for weeks on end. When you leave one of our salons, your brows will look gorgeous and flawless. Here are five tips for you to maintain flawless brows. Commence with the tail end of the eyebrow and use light, short strokes to fill in the tail by starting at the arch and extending towards the end of the eyebrow. Finish off the end with a point. Build your baseline across the bottom of the body of the brow. Frame and fill the body of the brow. Create a parallel line to the baseline of the brow. Then fill the area in between while avoiding the start of the eyebrow. Fill in the start of the eyebrow. Complete the inside edge of the brow using a light touch. This will avoid a “drawn” on look. Why waxing over other forms of hair removal? What about male facial waxing? If you have unwanted facial hair, you know that it can be embarrassing especially those fine hairs (known as superfluous and vellus hair) which are barely noticeable but can be seen on those areas like the lip and back of the ear. Especially in sunlight. At Essential Beauty, the good news is that it is easy to remove all that hair so you can hold your head up high! Book Online Now with one of our waxing professionals to get you looking smoother and younger. Feeling Smooth is better because waxing removes the facial hair from the root as opposed to cutting it off at the surface. This causes the hair to grow back smoothly and leaves you razor rash and stubble free. Waxing is economical and you do not have to make a large investment to be silky smooth 24/7. Less hair will grow back. Now that is good news. One of the great benefits of waxing your facial hair is that the more you wax, the less hair will grow. With waxing you get long lasting results. Waxing lasts 2 to 3 weeks longer than other forms of facial hair removal. Just wax and forget. Perfect! The eyes are the window to the soul. Check out our full section on eyebrow waxing. Many people find themselves in need of hair removal from the ear and waxing is a superb option. It is best to leave this to our professional staff because the ears can be sensitive and difficult to remove hair from, unless you have eyes in the back of your head! The hair on the cheek can be difficult to remove also because it is fine and light. Waxing can really assist in this regard because it can extract every last strand of facial peach fuzz. As mentioned earlier, waxing provides one of the longest times in between services for hair regrowth. When undertaken by a trained waxing professional, waxing is the best method and much less painful than other methods. Whilst there are other methods for the removal of hair from the chin, waxing is the most effective. The chin can be known to have thicker, coarser hair with stronger roots making waxing, the optimum choice for hair removal over other techniques. Most people have sideburns but when they are darker, they can make you feel self-conscious especially when wearing your hair in a particular manner. For example, being pulled back. The same is also true for an uneven hairline. The ability to wax your hairline and sideburns will give you a clean and perfect line. Also, it will give you the added benefit that hair returning in the future, will be finer and consequently be easier to manage. Nose hairs can become long and unruly and basically stick out. Our focus is to wax the outer edge of your nostrils and also to some degree, the inner nostril. It is important to see one of our waxing professionals because of this sensitive area to ensure that you do not remove too much hair. Remember, nose hairs actually do have a purpose but need to be managed. Waxing is a long-lasting option for hair removal which results in the hair growing back finer over time. In addition to cleaning the hairline on your face, waxing the hairline on the back of your neck will give you a clean line also. There are multiple ways that you can remove unwanted hair from your face. Below, we compare waxing to other hair removal procedures so that you can make an informed decision that suits your particular situation. We want you to be the best you can be. Threading involves using a string of cotton thread to remove hair and short rows from your face. Because it removes each hair individually, it can be uncomfortable and painful. In fact, more so than facial waxing. In addition, threading can be very difficult on sensitive skin particularly if you suffer acne or have any other skin problems. Our Natural Comfort Film Wax and trained waxing professionals, know that we can treat even the most sensitive skins. It can be difficult to find a good threader, but with our trained waxing professionals, you need look no further for an expert. Face shaving for women is certainly not recommended as the results are short-term and the razor only cuts the hair and doesn’t remove it from the root. You also liable to have stubble regrowth which can look embarrassing. Tweezing is a slower and more painful experience to waxing and the results do not last as long. In addition, it is very easy to break or miss the small hairs. Some women use an epilator to tweeze the hair from the roots more quickly. This is a lot more painful and we recommend manual tweezers to take care of those superfluous stray hairs and create a more blended look with your forehead. Our trained professionals know how to create an eyebrow shape and blend into the forehead at the same time. Both of these can be expensive and require a number of treatments. In addition, there are less expensive at-home options but these can be potentially dangerous and can give terrible results. In addition, laser is not recommended for people with light or dark skin as it does not work. When you bleach unwanted facial hair, this doesn’t remove the hairs, it just makes them less noticeable. This option can work if you don’t have a lot of hair but the hair is still visible up close. Further, bleaching products can irritate sensitive skin. Our Natural Comfort Film Wax and trained professionals know how to wax even the most sensitive of skins. Chemicals present in depilatory creams weaken hair follicles so you can wipe away the hair from your skin. Because of the harsh chemicals involved, they can irritate your skin. Since the skin on your face is especially sensitive, this is not recommended. Our Natural Comfort Film Wax and waxing professionals have 25+ years of waxing the most sensitive skins and removing facial hair. What can I expect from Essential Beauty? There are many ways you can remove hair from the face. Making a booking with one of our waxing professionals Online or in salon. They will help you determine where you should remove those pesky hairs using the appropriate method. Am I normal if I have excess hair? Never be embarrassed by your individual circumstances. It is totally normal to have unwanted hair on your face. This process is about making you look and feel your very best, in the skin you have. There is little discomfort which is normal during your first-time facial waxing. However, it will hurt less and less every time you come and visit us. Like any other area that you wax, the skin around the area may become a little red after your visit. Best to plan ahead and get a wax 2 to 3 days before any event. The skin on your face is more sensitive than other areas and so you may experience some slight sensitivity. If you experience extreme sensitivity, please consult one of our professionals. Males have facial waxing on the brows, ear, nose, back of neck. In fact, anywhere hair is a problem. Waxing can last up to 3 weeks and when the hair eventually grows back, it will be lighter and less dense. It will make further clean-up of the area even easier. As always, trust the waxing professionals at Essential Beauty so we can achieve the best and sharpest perfectly groomed look. Remember that nose hairs serve a purpose but excessive hair which pokes out is not a good look! Waxing the outer tip of your nose and the inner nostril is painless and creates awesome results. See one of our waxing professionals to treat this sensitive area to ensure you remove exactly the right amount of hair. Males often get thick and dark hair growing on their ears and waxing is one of the best ways to remove these hairs. This leaves your ears totally smooth. Ears can be sensitive and difficult to wax so let the professionals at Essential Beauty help you look and feel your best. Male grooming of the eyebrows is critical for that sculptured look preventing eyebrows from becoming unruly. Tinting is the fastest way to give your face an instant lift. Your lashes will look longer and fuller and your eyebrows will look fuller and longer with more defined arches. Our trained therapists use a range of tints developed in Germany that have been dermatologically tested and created exclusively for eyelash and eyebrow hair. You’ll get a natural looking, long wearing result – plus more time and freedom in the mornings! Why eyelash or eyebrow tinting? You want to wake up looking fresh and youthful. You do not want to fuss with makeup, pencils and mascara. You want to add fullness and definition to your eyebrows and eyelashes. You want to cover grey, white or sun-bleached hairs. You want to regain the eyebrow definition you once had. You want to open up your eyes with eyelash tinting. You want fuller, thicker looking eyebrows. You want sweat-proof, moisture-proof colour all day, every day. You want to feel more confident. You want sweat-proof, moisture-proof colour for your holiday. Have an idea about the colour you would like. Most people – even if they are blonde – choose Blue Black, the darkest colour for the eyelashes. For a more natural, subtle look, your therapist can mix black and a natural brown. If you’re pregnant or prone to allergic reactions, ask for a patch test first. Although tinting is generally completely safe, it’s good to test before any treatment. Wear your contact lenses to the treatment and wait until the next day before wearing them again. Try to keep your eyes closed during eyelash tinting to avoid stinging. Open your eyes during eyelash tinting – this could make them sting. What happens during eyelash and eyebrow tinting…? Your wax professional will consider if a patch test is needed. If you have never had a tint before or you are prone to allergic reactions and eczema, she will advise you to do a patch test. Your wax professional will discuss your colour choice with you. It’s best to stay subtle if you are unsure. You can always make another appointment and go darker, but you cannot lighten your lashes and you will have to wait 4-6 weeks for the colour to fade. Your wax professional can mix a customised colour for you. For your eyebrows, she can also use a darker colour at the very front, a lighter tone in the middle where there are more hairs, and darker again on the arch and ends to give a more textured natural look. Your wax professional may place Vaseline around the area to protect your skin from the tint. Some wax professionals may omit this step. If you’re having an eyelash tint, your wax professional will place protective pads under your bottom eyelashes. You’ll be asked to close your eyes and relax while the tint is applied. Your wax professional will leave the tint on for 10-15 minutes depending on the colour and thickness of your eyelashes and eyebrows. If you have grey or white hairs, the tint may need to be left on longer. Your wax professional will use wet cotton pads to wipe the tint from your lashes or eyebrows. If you are having your eyelashes tinted, there is an extra step. You’ll be asked to keep your eyes closed and tilt your head to one side. Your wax professional will then remove any remaining tint by flushing it with water. Your wax professional will massage eye cream into your skin, then you’ll be asked to check your eyelash or eyebrow tinting. If you feel one of these steps has been missed or has not been done well, please let your wax professional know. When you work together with your wax professional, you will get the best possible results. Apply sunblock to your eyebrows and wear sunglasses if you are in direct sunlight The sun will cause your tint to fade faster. Rub your eyes straight after the procedure. Wear mascara or contact lenses for 12 hours. Go swimming for 24 hours. Use products that contain alpha-hydroxy acids (AHAs) or oil based or perfumed products. They can shorten the life of your tint. If you also want to have an eyebrow shape, have it done after your tint, as the enhanced colour will help to show up any flaws in your original shape. Your eyelash tint will last up to 6 weeks. Your eyebrow tint will last for 2-4 weeks. Longer lashes to die for! No matter how short or long your eyelashes are, you can have a Lash Lift. It will give your straight eyelashes a natural sweep upwards with a gentle curl, without you needing to reach for eyelash curlers every day. A Lash Lift will make your lashes instantly look longer, wider, brighter and more beautiful. Our trained wax professionals can give you gorgeous, flawless eyelashes for any occasion – whether it is for holidays, an engagement, wedding or the Christmas party season. You want your eyes to look more open, alert and beautiful. You want your lashes to appear longer. You want to add natural lift. You want to enhance your natural features. You want a semi-permanent treatment that will save you time every morning. Lie back and enjoy a little ‘me time’. Keep your eyes gently closed throughout the treatment. Tell your wax professional if the treatment feels uncomfortable or stings. This is rare, however, she needs to know if it does happen. Tell your therapist if the treatment feels uncomfortable or stings. This is rare, however she needs to know if it does happen. What happens during a lash lift…? Your wax professional will remove your eye make-up with a non-oily cleanser and blot your eyelashes dry with tissue. Your wax professional will place a strip of micro tape on your bottom lashes. You will be asked to close your eyes and your wax professional will apply a small amount of a water-based adhesive along the back of a silicone pad. Your wax professional will apply a perming gel and remove any excess perming with cotton buds. Your wax professional will apply a generous amount of setting lotion half way up the lash and also apply a nourishing lotion. After a few minutes, your wax professional will gently wipe your lashes with damp cotton buds to remove the adhesive and release your lashes. You will be asked to check the final result. If you feel one of these steps has been missed or has not been done well, please ask your wax professional and let her know. When you work together with your wax professional, you will get the best possible results. Feel free to wear mascara – although your Lash Lift does the job of mascara. Extra mascara will create a fuller look. Wear eye makeup for 24 hours. Get your lashes wet for 24 hours. Your Lash Lift will last for around 4-6 weeks. To maintain the look, we suggest you have repeat treatments; every 4-6 weeks. If you have any questions that are not answered here, contact our friendly staff at your nearest Essential Beauty salon for more information. How do I keep my Eyebrows looking great in between visits? There is no doubt that you will love the smooth and flawless new look of your face when you leave one of our salons. In addition, we want to make sure that you know how to maintain your wax so you continue to love the results even more in between your appointments. Cleanse your skin every morning and night and never go to bed with makeup on. This will make waxing easier and keep your skin looking healthy. Recommend Tonic Cleansing Milk or Clarifying Foaming cleanser. Exfoliate in between your waxing visits using our Tonic Microexfoliant. These products are gentle and nonabrasive with a lightweight field designed to eliminate dry dull surface cells and support cell regeneration to keep your skin looking flawless. Exfoliating the skin means the hairs are able to slide out more easily from their roots which will create longer lasting results. Exfoliation also helps the skin on your face better absorb moisturisers and other serums so they can work more effectively. Exfoliating regularly also reduces your chance of ingrown hairs on the chin and neck. We recommend Ingro Stopper to remove ingrown hairs. How long does Eyebrow Waxing last? To keep your brows looking for their awesome and flawless best, it is recommended that waxing be undertaken every 2 to 3 weeks. Is there a minimum age for Eyebrow Threading and Eyelash Perm? There is no minimum age limit on these services. Do I need to be 18+ for eyebrow threading and eyelash perms? No. There is no minimum age for this treatment. How do I look after my semi-permanent mascara? Do not allow water to come in contact with the eyelashes. Do not wash your eyes or eyelashes directly with hot water. Avoid heat, spas, saunas, swimming pools and exercise/anything that may cause excess sweating. Do not use products that contain oil around your eyes. Use only water soluble mascara. How long does semi-permanent mascara take to apply? The procedure takes approximately 30 minutes and you will be required to keep your eyes closed during this time. How do I prepare for my semi-permanent mascara appointment? Ensure you remove your mascara with an oil free cleanser. If you wear contact lenses, you should bring your lens container and solution with you. What does semi-permanent mascara consist of? The product is made up of black pigment along with powdered fibres which both thicken and lengthen natural lashes. Semi-permanent mascara is similar to traditional mascara but lasts 2-3 weeks. What are the benefits of party lashes? Party lashes are quick, cost effective and create fuller, longer and thicker looking eyelashes in minutes! You can look as natural or as cosmetic as you like. Remember to discuss your preferred look with your therapist in salon. How long do party lashes last? They will last anywhere from 2 days to 2 weeks. Party lashes are a great short term solution for getting glamorous eyes in minutes at a lower cost than other forms of eyelash enhancements. Can I wear mascara after perming? Yes, but you need to wait 48 hours before you apply any mascara to let the perm set fully. Some people like more thickness and volume. These people, in addition to their eyelash perm, will apply mascara for an even more dramatic look. We also offer permanent mascara application. See our permanent mascara section on this website for more information. Will the perm damage my eyelashes? No. Our lash lift system is gentle and proven giving great results. The whole process is finished with a nourishing oil application. In addition, your eyelashes receive the benefit of a break from wearing mascara daily. Eyelash perming will last the full life cycle of your eyelashes, around 4 weeks. What are the benefits of having my eyelashes permed? Having your eyelashes permed will make them stand out more prominently and will make a difference to your appearance. Perming is performed by placing your eyelashes onto specially designed pads that will lift and curl your eyelashes to make them look longer and more glamorous. The results are outstanding as your eyes appear more open giving you a fresher appearance. To get the best results, an eyelash tint directly after the eyelash perm will complete your look. You won’t need to apply mascara and you can swim, sauna and exercise with confidence as there is no smudging or smearing. You also don’t need to spend time removing mascara at the end of the day! You will wake up looking great as your eyelashes appear longer and more beautiful with the lift and tint together. How long does the eyebrow tint last? Eyebrow tinting can last 2-3 weeks depending on the colour. The darker the colour, the longer it will last. You need to stay away from products like Glycolic acid, Fruit acid peels, AHA’s and BHA’s. These products lighten the tint. Also remember to apply sunblock when you are out and about. If you would like a longer lasting result, look into the Semi-Permanent Makeup section on this website, as this may suit you better. We specialise in hairstrokes. Is it worth tinting my eyebrows if I already have dark eyebrows? This is partly because of the bleaching effect of the sun and partly because of genetics. Once the eyebrows are tinted, the very fine lighter hairs show up. This gives the whole eyebrow a fuller look. 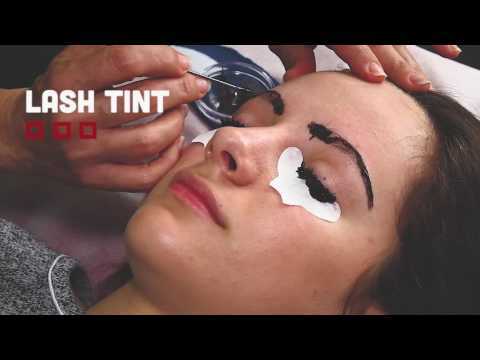 Tinting can also help improve the shape of the eyebrows. The top of the arch can be lifted by tinting the lighter hairs at the top of the brows. The ends can also be better defined and lengthened. Giving an overall better shape. I’ve got light eyebrows. Will eyebrow tinting make my eyebrows look too dark and fake? Brow tinting gives the eyebrow a fuller and more defined look. If you have blonde or red eyebrows, it is best to try graphite or light brown as this will give you a soft natural colour. We can mix the two colours to create an individual look. Ask your therapist in salon for more details. How long will my eyelash tint last? An eyelash tint lasts 3-4 weeks. Blue black is the darkest colour and lasts the longest. Blue black can look very intense depending on your desired look. Clients with blonde or red eyelashes may prefer to start with black or brown for a less dramatic and more natural look. Note the lighter colours may not last as long. How long does an eyelash tint take? Eyelash tints are quick and generally take 15- 20 minutes. Many customer will group their tint with a facial. We can apply the tint while your treatment mask is on. Some customers have even asked to have it applied while waxing the front of their legs! Ask your therapist for more details. The results are definitely worth it as you will save time with less makeup application needed. I have sensitive eyes – can I still tint? The tint works best if it is applied once you have your eyes closed. If you are concerned about an allergic reaction due to sensitivities, we can provide you with a patch test. Most customers find our tinting service relaxing as you get to lie down and rest for a full 20 minutes. Why are there varying lengths of lashes? Variation in the length of lashes is recommended to create a natural flow and look to the lashes. Longer lashes work best in the corners of the eyes or in the outer centre of the eyes. Shorter lashes work best towards the inner eyes. Discuss options with your therapist in salon.